One of the most remarkable things about the famine which occurred in China between 1958 and 1962 was that for over twenty years, no one was sure whether it had even taken place. So begins Jasper Becker’s Hungry Ghosts: Mao’s Secret Famine (The Free Press, 1996), the first account of how 30 to 45 million–or more–perished in China during a time of peace and the absence of natural disasters. How could 35-40 million die in three or four years? Was it the call to melt down household metal like pots, pans, spoons, and knives in backyard furnaces so China could turn this scrap metal into steel and beat out the Soviet Union in its steel production? Or was it the policy to kill the four pests–sparrows, rats, flies, and mosquitoes–in which crops died as a result? According to Becker these policies helped contribute to the problem, but the real culprits were the men in power. Mao was at the center, of course, but also leaders we’ve come to think of as reformers: Zhao Ziyang, Hu Yaobang, Deng Xiaoping, and Zhou Enlai. What’s ironic is that those who did speak out about the Great Leap Forward–Peng Dehuai and Liu Shaoqi–were ultimately killed for their stance against Mao. Both died during the Cultural Revolution. 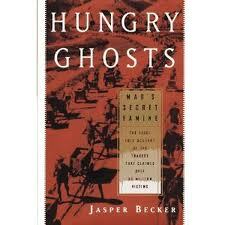 Hungry Ghosts isn’t an easy read for a number of reasons. The subject of course is completely depressing (probably not the best reading choice on New Year’s Eve), but it’s also structured in a way that lends to repetition. What stuck out was the opening line of the book. I’d always assumed the Cultural Revolution was the greater of the crimes, but according to Becker, it was the Great Leap Forward hands down. This book was published in 1996, and up to that time people in China still weren’t talking about the Great Leap Forward. Literature didn’t mention it and movies didn’t cover it, unlike the Cultural Revolution. Becker explains this silence. Peasants were the ones affected during the Great Leap Forward, while intellectuals and city folks were attacked in the Cultural Revolution. The peasants didn’t have a voice back then–and they still don’t. And when the party in power back then is the party in power now, no one in Beijing is anxious to come forth with the real story. Stuart, China is not the one claiming to be the “leader of the free world” and lecturing everyone on human rights; I was simply pointing out the insincerity of Western pronouncements on human rights. The fact that you’d come back with that quip is exactly what I meant by the “tendency to demonise China at every opportunity”. Stuart, I guess we will have this debate going forward for many posts. I’m trying to avoid politics because I wish to have my book published both in China and North America. I didn’t post that the “real great leap forward” by Deng Xiaoping was perfect. But look at China now, and compared it to 40-50 years ago, and you can see a Real “leap forward” economically. Nothing is perfect also in the Western World. Europe is under econonic collpase. In the greatest economy in the world, in the United States, 20% of the children live below the poverty line. My plan is come to China, when (and if) my book will get published there. Finishing on a positive note, listen to some wonderful Chinese songs posted on my blog and you will understand why some things in China are indeed beautiful. Peace to all. I agree Giora. I wish Westerners could write and feel about China just like Peter Hessler did. His books are welcomed by readers both in China and America. Although his books are all about ordinary people’s lives in China, he did write a little bit about politics and China political events in his books, but in a way that most Chinese readers accept and agree. Peter Hessler’s books are accepted in China because he glosses over the truth, disguises, distorts and glazes over the reality of what really happened. China Daily sang his praises – which is more than enough to discredit him. He is a puppet mouthpiece for the CCP, a soft, left leaning milk sop with no taste for the harsh realities of what life is really like. And you two, you blindly encourage others to accept this travesty as reality. Let’s face it. Westerners don’t really give a damn about human rights, Chinese or otherwise. This is why while everyone is quick to point out the horrors of the Tiananmen massacre, nobody seems to care, or even know, about the similar massacre that took place next door in South Korea just 9 years earlier because the latter was facilitated by the US. And what does the US say about its commitment to human rights when it befriends the brutal dictator of Uzbekistan (who boils his victims alive) and provides Saudi Arabia (yes, THAT beacon of democracy!) with a $60 billion-dollar arms deal? The Chinese know what the deal is, which is why they reacted the way they did in response to the anti-Chinese protests during the torch relays of the 2008 Olympics. Gee, T, would that be THAT Saudi Arabia that China just inked a multi-billion dollar oil deal with? Or the Uzbekistan that China also deals with? Oh yes, my ayi in China talked to me at length about the Great Leap Forward. Obviously it is still a very emotional subject. This sounds like a fascinating book. Thanks for the review! Wow, I can only imagine those stories. How terrible. I’m reading Lisa See’s new novel, which takes place during the Great Leap Forward. I’m 145 pages into the book and the GLF has just started. It’ll be interesting to see how she treats it. The Great Leap Forward statred with good intentions to industraliaze China quickly, but ended in catasrophe due to great grain shortage. The leader who really put China forward was Deng Xiaoping who is credited with developing China into the second largest economy in the world, soon to be the greatest. If it’s so great, Giora, why not come and live here, and experience it first hand? Come and see the marvels of the economy, where children starve, beggars roam the streets, and people pick through the discarded waste to try and eek a living…. Where there’s no live television or radio, in case someone actually tells the truth – even if by accident. Deng Xiaoping created this miracle economy by throwing half the population under the economic bus – the ones he didn’t just have executed for dissent. He was a military strategist, not an economic analyst. Life isn’t a novel, it’s non-fiction – and the pages are stained with tragedy. The Great Leap Forward is another reason nobody believes in god anymore. An another reason more and more people are not going to allow egos or idiots to dictate their lives. Every country has bits it tries to sweep under the rug, but very few of them censor history books quite so effectively. Mind you, history is written by the winners… the victims don’t often get to spin their side in the books. Especially when they’ve either starved to death, or been exiled into obscurity.